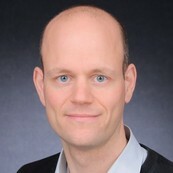 The application of established empirical methods (e.g., controlled experiments, replicated case studies, surveys) in software engineering is still limited. Because many new software engineering methods and tools are not formal enough for validation with sound mathematical proofs, systematic experimentation is necessary to validate their promised benefits. Although the use of empirical methods in software engineering has risen drastically during the last 10 years, many research proposals are still only advocated by their authors instead of validated systematically using experimentation. Existing experiments often do not exhibit sound research practises and lack in statistical analyses. Are peer reviews a viable alternative to pair programming? 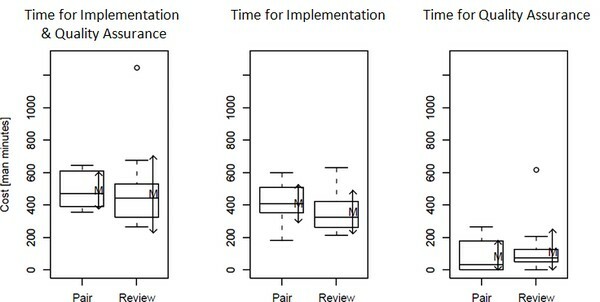 The results above (boxplots) obtained through empirical software engineering suggest that almost the same efforts are required for both methods (Müller2004). My research applies empirical research methods on performance prediction and software architecture evaluation, rather than improving empirical methods themselves. For my diploma-thesis (MSc. ), I conducted a small experiment with 30 students. For my PhD-thesis, I was involved in another student-experiment together with Anne and Steffen.